The NASA Pathfinder, NASA Pathfinder Plus, NASA Centurion and NASA Helios Prototype were an evolutionary series of solar- and fuel-cell-system-powered unmanned aerial vehicles. AeroVironment, Inc. developed the vehicles under NASA's Environmental Research Aircraft and Sensor Technology (ERAST) program. They were built to develop the technologies that would allow long-term, high-altitude aircraft to serve as "atmospheric satellites", to perform atmospheric research tasks as well as serve as communications platforms. 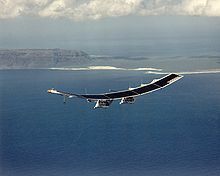 AeroVironment initiated its development of full-scale solar-powered aircraft with the Gossamer Penguin and Solar Challenger vehicles in the late 1970s and early 1980s, following the pioneering work of Robert Boucher, who built the first solar-powered flying models in 1974. Under ERAST, AeroVironment built four generations of long endurance unmanned aerial vehicles (UAVs), the first of which was the Pathfinder. In 1983, AeroVironment obtained funding from an unspecified US government agency to secretly investigate a UAV concept designated "High Altitude Solar" or HALSOL. The HALSOL prototype first flew in June 1983. Nine HALSOL flights took place in the summer of 1983 at Groom Lake in Nevada. 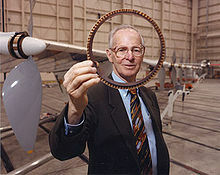 The flights were conducted using radio control and battery power, as the aircraft had not been fitted with solar cells. HALSOL's aerodynamics were validated, but the investigation led to the conclusion that neither photovoltaic cell nor energy storage technology were mature enough to make the idea practical for the time being, and so HALSOL was put into storage. In 1993, after ten years in storage, the aircraft was brought back to flight status for a brief mission by the Ballistic Missile Defense Organization (BMDO). 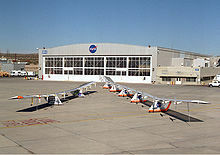 With the addition of small solar arrays, five low-altitude checkout flights were flown under the BMDO program at NASA Dryden in the fall of 1993 and early 1994 on a combination of solar and battery power. In 1994 the aircraft transferred to the NASA ERAST Program to develop science platform aircraft technology. It was renamed "Pathfinder" because it was "literally the pathfinder for a future fleet of solar-powered aircraft that could stay airborne for weeks or months on scientific sampling and imaging missions". A series of flights were planned to demonstrate that an extremely light and fragile aircraft structure with a very high aspect ratio (the ratio between the wingspan and the wing chord) can successfully take-off and land from an airport and can be flown to extremely high altitudes (between 50,000 feet (15,000 m) and 80,000 feet (24,000 m)) propelled by the power of the sun. In addition, the ERAST Project also wanted to determine the feasibility of such a UAV for carrying instruments used in a variety of scientific studies. On October 21, 1995, the aircraft's fragility was aptly demonstrated when it was severely damaged in a hangar accident, but was subsequently rebuilt. Pathfinder was powered by eight electric motors - later reduced to six - which were first powered by batteries. It had a wing span of 98.4 feet (30.0 m). Two underwing pods contain the landing gear, batteries, instrumentation system, and flight control computer. 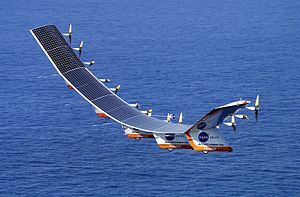 By the time the aircraft was adopted into the ERAST project in late 1993, solar cells were being added, eventually covering the entire upper surface of the wing. The solar arrays provide power for the aircraft's electric motors, avionics, communications and other electronic systems. Pathfinder also had a backup battery system that can provide power for between two and five hours to allow limited-duration flight after dark. Pathfinder flies at an airspeed of only 15 miles per hour (24 km/h) to 25 miles per hour (40 km/h). Although pitch control is maintained by the use of tiny elevators on the trailing edge of the wing, turns and yaw control are accomplished by slowing down or speeding up the motors on the outboard sections of the wing. Major science activities of Pathfinder missions have included detection of forest nutrient status, forest regrowth after damage caused by Hurricane Iniki in 1992, sediment/algal concentrations in coastal waters and assessment of coral reef health. Science activities are coordinated by the NASA Ames Research Center and include researchers at the University of Hawaii and the University of California. Pathfinder flight tested two ERAST-developed scientific instruments, a high spectral resolution Digital Array Scanned Interferometer (DASI) and a high spatial resolution Airborne Real-Time Imaging System (ARTIS), both developed at Ames. These flights were conducted at altitudes between 22,000 feet (6,700 m) and 49,000 feet (15,000 m) in 1997. On September 11, 1995, Pathfinder set an unofficial altitude record for solar powered aircraft of 50,000 feet (15,000 m) during a 12 hour flight from NASA Dryden. This and subsequent records claimed by NASA for Pathfinder remain unofficial, as they were not validated by the FAI, the internationally-recognized aviation world record sanctioning body. The National Aeronautic Association presented the NASA-industry ERAST team with an award for one of the "10 Most Memorable Record Flights" of 1995. After further modifications, the aircraft was moved to the U.S. Navy's Pacific Missile Range Facility (PMRF) on the Hawaiian island of Kauai. On one of seven flights there in the spring and summer of 1997, Pathfinder raised the altitude record for solar-powered aircraft - as well as propeller-driven aircraft - to 71,530 feet (21,800 m) on July 7, 1997. During those flights, Pathfinder carried two lightweight imaging instruments to learn more about the island's terrestrial and coastal ecosystems, demonstrating the potential of such aircraft as platforms for scientific research. During 1998, the Pathfinder was modified into the longer-winged Pathfinder-Plus configuration. 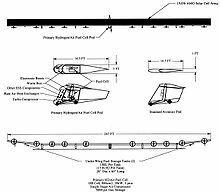 It used four of the five sections from the original Pathfinder wing, but substituted a new 44 feet (13 m) long center wing section that incorporated a high-altitude airfoil designed for the follow-on Centurion/Helios. The new section was twice as long as the original, and increased the overall wingspan of the craft from 98.4 feet (30.0 m) to 121 feet (37 m). The new center section was topped by more-efficient silicon solar cells developed by SunPower Corporation of Sunnyvale, California, which could convert almost 19 percent of the solar energy they receive to useful electrical energy to power the craft's motors, avionics and communication systems. 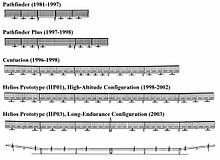 That compared with about 14 percent efficiency for the older solar arrays that cover most of the surface of the mid- and outer wing panels from the original Pathfinder. Maximum potential power was boosted from about 7,500 watts on Pathfinder to about 12,500 watts on Pathfinder-Plus. The number of electric motors was increased to eight, and the motors used were more powerful units, designed for the follow-on aircraft. The Pathfinder-Plus development flights flown at PMRF in the summer of 1998 validated power, aerodynamic, and systems technologies for its successor, the Centurion. On August 6, 1998, Pathfinder-Plus proved its design by raising the national altitude record to 80,201 feet (24,445 m) for solar-powered and propeller-driven aircraft. In July 2002 Pathfinder-Plus carried commercial communications relay equipment developed by Skytower, Inc., a subsidiary of AeroVironment, in a test of using the aircraft as a broadcast platform. Skytower, in partnership with NASA and the Japan Ministry of Telecommunications, tested the concept of an "atmospheric satellite" by successfully using the aircraft to transmit both an HDTV signal as well as an IMT-2000 wireless communications signal from 65,000 feet (20,000 m), giving the aircraft the equivalence of a 12 miles (19 km) tall transmitter tower. Because of the aircraft's high lookdown angle, the transmission utilized only one watt of power, or 1/10,000 of the power required by a terrestrial tower to provide the same signal. According to Stuart Hindle, Vice President of Strategy & Business Development for SkyTower, "SkyTower platforms are basically geostationary satellites without the time delay." Further, Hindle said that such platforms flying in the stratosphere, as opposed to actual satellites, can achieve much higher levels of frequency use. "A single SkyTower platform can provide over 1,000 times the fixed broadband local access capacity of a geostationary satellite using the same frequency band, on a bytes per second per square mile basis." Ray Morgan, president of AeroVironment, has described the concept as, "What we're trying to do is create what we call an 'atmospheric satellite,' which operates and performs many of the functions as a satellite would do in space, but does it very close in, in the atmosphere"
Centurion, originally built for the 100,000 feet (30,000 m) altitude on solar power milestone specified by the ERAST project, was the third generation aircraft in this series. The ERAST program managers had determined that an aircraft based on the Pathfinder/Pathfinder Plus concept would be the lowest risk approach of achieving the altitude goal. 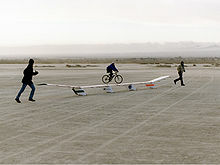 Initially, a quarter-scale model of the Centurion was test flown at El Mirage Dry Lake on March 4, 1997. The full-size Centurion's maiden flight took place at Rogers Dry Lake on November 10, 1998, and lasted a total of 1 hr and 24 minutes. At the time, it weighed in at 1,385 pounds (628.2 kg) (including a 150 pounds (68.0 kg) steel anvil hanging on its centerline to simulate a payload) for its first flight. The flight was nearly flawless and was followed by a second similar performance on November 19, this time before a crowd of VIPs and Media. It lasted 1 hr and 29 minutes. The third and final flight of the low altitude test series took place on December 3. On this flight the vehicle was loaded down to its maximum gross weight of 1,806 pounds (819.2 kg) to test its weight carrying capability. Total flight time on this flight was 30 minutes, as it was shortened because high winds were anticipated by mid-morning. All of these flights took place on battery power and verified the design's handling qualities, performance, and structural integrity. Following these three flights, NASA decided to expand the aircraft into the Helios Prototype, with work starting in January, 1999. The design of Centurion resulted in an aircraft that looked very much like the Pathfinder, but with a much longer wingspan of 206 feet (63 m). Although the Centurion shape resembled the Pathfinder, the structure was designed to be stronger and capable of carrying numerous payloads (up to 600 pounds (272.2 kg)) more efficiently. Its wing incorporated a redesigned high-altitude airfoil and the span was increased to 206 feet (63 m). The number of motors was increased to 14 and the number of underwing pods to carry batteries, flight control system components, ballast, and landing gear rose to four. 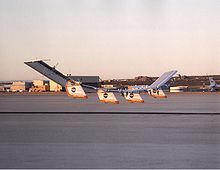 The Centurion was modified into the Helios Prototype configuration by adding a sixth 41 feet (12 m) wing section and a fifth landing gear and systems pod, becoming the fourth configuration in the series of solar-powered flying wing demonstrator aircraft developed by AeroVironment under the ERAST project. The larger wing on the Helios Prototype accommodated more solar arrays to provide adequate power for the sun-powered development flights that followed. The aircraft's maiden flight was on September 8, 1999. The ERAST program had two goals when developing the Helios Prototype: 1) sustained flight at altitudes near 100,000 feet (30,000 m) and 2) endurance of at least 24 hours, including at least 14 of those hours above 50,000 feet (15,000 m). To this end, the Helios Prototype could be configured in two different ways. The first, designated HP01, focused on achieving the altitude goals and powered the aircraft with batteries and solar cells. The second configuration, HP03, optimized the aircraft for endurance, and used a combination of solar cells, storage batteries and a modified commercial hydrogen-air fuel cell system for power at night. In this configuration, the number of engines was reduced from 14 to ten. Airplane Picture - AeroVironment Chairman Paul MacCready shows a cross section of the AeroVironment/NASA Helios Prototype wing spar. Using the traditional incremental or stair-step approach to flight testing, the Helios Prototype was first flown in a series of battery-powered development flights in late 1999 to validate the longer wing's performance and the aircraft's handling qualities. Instrumentation that was used for the follow-on solar-powered altitude and endurance flights was also checked out and calibrated during the initial low-altitude flights at NASA Dryden. The Helios Prototype is an ultra-lightweight flying wing aircraft with a wingspan of 247 feet (75 m), longer than the wingspans of the U.S. Air Force C-5 military transport (222 feet (68 m) or the Boeing 747 (195 feet (59 m) or 215 feet (66 m), depending on the model), the two largest operational aircraft in the United States. The electrically powered Helios is constructed mostly of composite materials such as carbon fiber, graphite epoxy, Kevlar, styrofoam, and a thin, transparent plastic skin. The main tubular wing spar is made of carbon fiber. The spar, which is thicker on the top and bottom to absorb the constant bending motions that occur during flight, is also wrapped with Nomex and Kevlar for additional strength. The wing ribs are also made of epoxy and carbon fiber. Shaped styrofoam is used for the wing's leading edge and a durable clear plastic film covers the entire wing. The Helios Prototype shares the same 8 feet (2.4 m) wing chord (distance from leading to trailing edge) as its Pathfinder and Centurion predecessors. The 247-foot (75 m) wingspan gives the Helios Prototype an aspect ratio of almost 31 to 1. The wing thickness is the same from tip to tip, 11.5 inches (29 cm) inches or 12 percent of the chord, and it has no taper or sweep. The outer panels have a built-in 10-degree dihedral to give the aircraft more lateral stability. A slight upward twist at the tips of the trailing edge helps prevent wing tip stalls during the slow landings and turns. The wing area is 1,976 sq ft (183.6 m)., which gives the craft a maximum wing loading of only 0.81 lb./sq. ft. when flying at a gross weight of 1,600 lb. The all-wing aircraft is assembled in six sections, each about 41 feet (12 m) long. An underwing pod is attached at each panel joint to carry the landing gear, the battery power system, flight control computers, and data instrumentation. The five aerodynamically shaped pods are made mostly of the same materials as the wing itself, with the exception of the transparent wing covering. Two wheels on each pod make up the fixed landing gear-rugged mountain bike wheels on the rear and smaller scooter wheels on the front. The only flight control surfaces used on the Helios Prototype are 72 trailing-edge elevators that provide pitch control. Spanning the entire wing, they are operated by tiny servomotors linked to the aircraft's fight control computer. To turn the aircraft in flight, yaw control is applied by applying differential power on the motors - speeding up the motors on one outer wing panel while slowing down motors on the other outer panel. A major test during the initial flight series was the evaluation of differential engine power as a means of pitch control. During normal cruise the outer wing panels of Helios are arched upward and give the aircraft the shape of a shallow crescent when viewed from the front or rear. This configuration places the motors on the outer wing panels higher than the motors on the center panels. Speeding up the outer-panel motors caused the aircraft to pitch down and begin a descent. Conversely, applying additional power to the motors in the center panels caused Helios to pitch up and begin climbing. Solar panels, supplied by SunPower were then installed in 2000. The cells featured a rear-contact cell design that placed wires on the underside of the cells, so as not to obstruct the cells' exposure to solar radiation. On August 13, 2001, the Helios Prototype piloted remotely by Greg Kendall reached an altitude of 96,863 feet (29,524 m), a world record for sustained horizontal flight by a winged aircraft. The altitude reached was more than 11,000 feet (3,400 m) - or more than 2 miles (3.2 km) - above the previous altitude record for sustained flight by a winged aircraft. In addition, the aircraft spent more than 40 minutes above 96,000 feet (29,000 m). On June 26, 2003, the Helios Prototype broke up and fell into the Pacific Ocean about ten miles (16 km) west of the Hawaiian Island Kauai during a remotely piloted systems checkout flight in preparation for an endurance test scheduled for the following month. On the morning of the accident, weather forecasts indicated that conditions were inside the acceptable envelope, although during the preflight go/no-go review, the weather forecaster gave it a "very marginal GO." One of the primary concerns was a pair of wind shear zones off the island's coast. After a delayed take off, due to the failure of the winds to shift as predicted, Helios spent more time than expected flying through a zone of low-level turbulence on the lee side of Kauai, because it was climbing more slowly than normal, since it had to contend with cloud shadows and the resultant reduction in solar power. As the aircraft climbed through 2,800 feet (850 m), according to the subsequent mishap investigation report, "At about 30 minutes into the flight, the aircraft encountered turbulence and morphed into an unexpected, persistent, high dihedral configuration. As a result of the persistent high dihedral, the aircraft became unstable in a very divergent pitch mode in which the airspeed excursions from the nominal flight speed about doubled every cycle of the oscillation. The aircraft’s design airspeed was subsequently exceeded and the resulting high dynamic pressures caused the wing leading edge secondary structure on the outer wing panels to fail and the solar cells and skin on the upper surface of the wing to rip off. The aircraft impacted the ocean within the confines of the PMRF test range and was destroyed. Most of the vehicle structure was recovered except the hydrogen-air fuel cell pod and two of the ten engines, which sank into the ocean." This article contains material that originally came from the web article "Unmanned Aerial Vehicles" by Greg Goebel, which exists in the Public Domain.